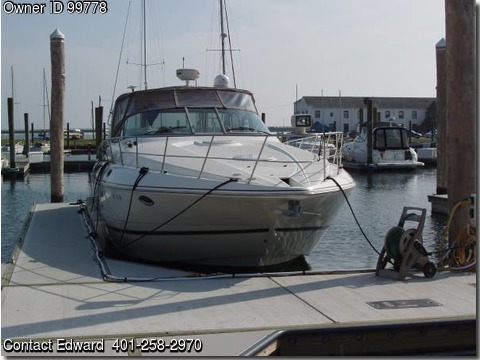 Boat is located in Newport,Rhode Island.Please contact the owner @ 401-258-2970 or whitemaned@live.com…Twin 8.2L Mercruiser MAG MPI Horizon engines (260 hours) with new risers, manifolds & hoses spring 2013. V-drives Bow & stern water jet thrusters, anchor windlass, ice maker, full galley with SS sink, new microwave/convection oven, glass 2-burner stove top & full size refrigerator. KVH Satellite & regular TV antennas. Queen size V-berth fwd with twin single berth aft that converts to a queen size berth. Two head/showers (fwd has full shower stall) with Vacuflush heads. 75 gal fresh water tank & 50 gal black water tank. New top canvas mid 2014. Central vacuum, AM/FM stereo with 6-disc CD changer. 2 12kw heat/ac’s, 4 TV’s,VHF, 24 mile Raytheon C80 radar/GPS, autopilot. Kohler 6.5 KW generator, fwd looking, steerable beam depth sounder, standard depth sounder, Bennett hydraulic trim tabs, hydraulic steering with autopilot interface. Underwater stern blue LED lights, 4 50ft 30A shore power cords with 50A-twin 30A adapter. In the water ready to cruise. new bottom paint and zincs.